I mentioned this recipe in a previous post. It’s from Food 2.0 by former Google Chef, Charlie Ayers. The book is awesome, but if you don’t have it yet, lucky for you there’s a copy of the recipe on the SF Gate. Click Here! These were extremely quick and the results were fabulous. The bars, which I cut rather large, were perfect level of sweetness (remember to use unsweetened coconut) and have plenty of chocolate to satisfy chocoholics. 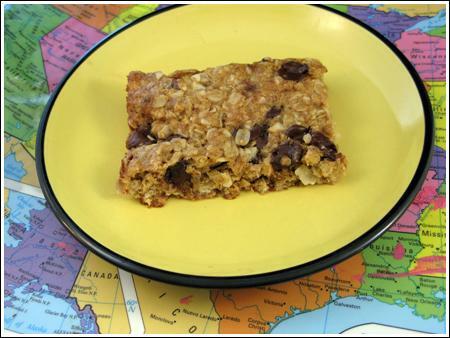 There’s absolutely no fault with this bar, and with the coconut, oats and chocolate, I don’t even miss the lack of nuts. For the coconut, I used some unsweetened coconut chips/flakes from Whole Foods. The recipe calls for shredded, so I buzzed the flakes in the food processor and they worked beautifully. For the brown sugar, I used “Dark”. 1) sweetened coconut can be substituted, but you should reduce the sugar to about 1/4 cup. Cathie, thanks for the variation. I never would have thought to make the oatmeal base chocolate flavored. Yum. I’ve made these a couple times and I used regular sweetened coconut and added one tablespoon of Hershey’s dark cocoa powder to the flour to compensate. They are SO much better with the cocoa. I have made these several times and everyone likes them. I will be making them for our Memorial Day family gathering. They are a great burst of energy without all of the calories. Elise, they should hold together. Next time, try using a few tablespoonfuls less flour. It sounds like maybe you are scooping your flour too heavily. I made these and they taste great but are somewhat crumbly and didn’t “hold together” well. The mix seemed a little dry to me. Any suggestions of how to make them a little more moist? I made these and substituted untoasted wheat germ for the coconut. Since I had coconut extract on hand, I added some of that (about 1 tsp) along with the vanilla. This probably changed the texture from the original recipe, but they turned out really well – even though I could not really taste the coconut flavoring. Maybe next time I will add more! Thanks for testing with the sweetened coconut. So now we know that we can use sweetened coconut and reduce sugar to 1/4 cup. I’m going to put a note on the recipe for people who don’t read comments. Love the cherry idea! I made this tonight- they’re simple to make and good, if a little buttery (not that that is necessarily a bad thing I guess) I could only find sweetened coconut at the market so I used that and just halved the sugar to a 1/4 cup. Worked out fine, not overly sweet at all. Also added a 1/4 cup of dried cherries to the mix and it added a very welcome tart zing to the bars. Thanks for the review. I am really happy to hear that these taste good with canola oil in place of butter. Again, thanks for testing and reporting back. I made these this afternoon substituting canola oil for the melted butter. Although I can’t compare them to the original recipe, I’d say they are pretty darn good! The texture was great, crispy on the edges and a little chewy on the inside. I’m sure I’d like them better with butter, because butter is almost always better, but I’ll try not to think of what I’m missing and will definitely make them again with the canola oil. Super quick and easy without the mixer! I also substituted a combination of white chocolate chips and peanut butter chips in half the pan (my husband is allergic to chocolate), but left chocolate chips in the other half. Both options were really good. Thanks for posting the recipe. Julie, you are right. It seemed healthy enough to be a snack, but the chocolate made it rich enough for dessert. Joe, Jeff looks a lot like you in that photo. Or maybe I was tired when I looked at it. Oatmeal Cookie Guy, you’re cool! Good luck with your project. Mary, that’s great! It is interesting how the coconut doesn’t overpower. I am not a huge coconut fan, but I loved these bars. BB, I’ll watch your blog to see how it goes with sweetened. As for unsweetened, have you checked the freezer section? Sometimes you can find it there. Carrie, I know the feeling! I kind of like that my tastes are changing with age. I just wish I’d wake up one day and like seafood. As I get older, and boy that is happening way too fast, I like coconut more and more and these look DELICIOUS! Those look so great! I may try them using some PB or butterscotch chips! I don’t remember seeing unsweetened coconut at the store though, I may have to try just using the sweetened and cutting back on the sugar some. just made these for my mother-in-law who loves coconut. my husband absolutely despises coconut…so, these are a special treat for her. the funny thing is that my husband tried them and actually liked them! These bars look tasty and quick! I’ll let Jeff know that you like him in his Pirate ears! I saved this recipe, and I’m so glad you it worked out so well for you! I want to try it… sort of a cross between a dessert and a snack. I was wondering the same thing. The butter adds a lot of flavor, but oil might work. If you try it, let me know. these look great – how do you think they would be substituting oil for the butter. i’m thinking that the butter is melted, so texture-wise it might be ok, of course that yummy butter taste wouldn’t be there… what do you think? p.s. i love your blog – check it every day (multiple times:-). Natalie, she will love these. That is, if she also likes oats ;). Kat, the oatmeal really adds to these, but I think they’d still be good without it. Maybe you could try it with some pecans or walnuts? VG, I thought you might like this one! quick & fabulous – sounds like my kind of recipe! especially with the coconut & chocolate combination. I’m new to comment, but couldn’t resist asking. Would these be okay without coconut? I’m just not a fan. My mom LOVES coconut. I’ll be sure to try these out for a mother’s day treat.